Back in October I moved from Boston to Southern New Hampshire. Ever the procrastinator, I put off getting a new drivers license. After being pulled over and given warnings (twice) by the same police officer, I was given a ticket. This is all my fault, and I bear no ill will towards the Hollis police department, but I digress. Naturally, I put off paying the ticket until the 29th of the 30 days alotted to do so, today. I checked the NH website to see where I could pay, but there was no information. All that was there were directions to mail the ticket and payment. Mail? In 2009? Seriously? 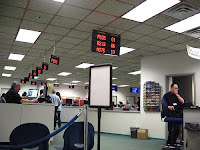 Well mailing was out of the question, so I drove to the nearest dmv (~20 min away) to make a payment. The woman there curtly thrust a piece of paper in my face with a number to call. However, upon calling the number it was busy. Naturally, I hung up and called again...and again.. and again. I called nonstop for 40 minutes (no exaggeration) before I got through and made my payment. During this tedious excercise my mind wandered. How much time and money is spent on collecting payments such as these? Wouldn't it be great if officers carried a credit card scanner with them, and I could pay then and there? No lost tickets (did I mention I lost my ticket? ), instant punishment (perhaps nudging people to drive safer and not procrastinat), and less support staff required to answer my questions. With all the talk about improving infrastructure, I hope to see federal/state/local agencies streamline themselves to the point where the processing time is measured in minutes, not months.